Chanting “RSS turn around, we don’t want you in our town!,” the activists—mostly young South Asian women— interrupted speaker Mohan Bhagwat, head of the Rashtriya Swayamsevak Sangh (RSS). The RSS is a hardline right-wing organization advocating Hindu nationalism or Hindutva, the political and cultural ideology that India is a fundamentally Hindu country. The RSS and other Hindu nationalist organizations have a long history of violence against religious minorities and people oppressed by India’s hierarchical caste system. The RSS is the ideological heart of the Bharatiya Janata Party (BJP), currently in power in India under Prime Minister Narendra Modi. The current right-wing government has failed to take action against attacks on Indian religious minorities, with senior BJP officials even justifying rising anti-Muslim mob lynchings. The Chicago South Asians for Justice action was one of a number of protests of the Congress over several days. The Alliance for Justice and Accountability, a coalition of progressive groups, coordinated a campaign against the Congress. Sikh, Muslim, Dalit, and Kashmiri communities led organizing efforts as well. The crowd’s reaction to the Chicago South Asians for Justice protesters was violent. According to a group statement, a video from the Alliance for Justice and Accountability, and personal testimony of protesters, the activists were immediately attacked by the crowd. Attendees rose a chant of “Bharat Mata ki jai,” or “Victory to Mother India,” a nationalist slogan feminists have critiqued for its depiction of the nation as a woman. Activists reported being kicked, punched, choked, spat at, and verbally abused. One activist was called a “dirty Muslim” and given death threats. Two activists were arrested, and one Congress attendee was arrested and charged with battery for spitting in an activist’s face. Protesters have been subject to online harassment from Hindutva supporters since. I spoke to two activists from Chicago South Asians for Justice, organizers Mansi Kathuria and Tara Raghuveer, about the action. (I know Raghuveer from previous organizing.) Chicago South Asians for Justice describes themselves as “a coalition resisting the rise of global fascism in the United States, India, and worldwide.” I asked them why their group decided to take such a visible action against Hindu nationalism, and how they view Hindutva in relation to growing white nationalism in the United States. Not everyone is making these connections. While the action was widely reported in India, where similar political violence involving right-wing groups is commonplace, the protest received minimal attention in U.S. media beyond progressive outlets. Raghuveer felt his confusion represented white Americans’ tendency to flatten the diverse experiences and political opinions of Asian Americans. “As a diasporic community we’re treated as a monolith,” she said. While Kathuria cautions that Hindu nationalism is specific to the history of South Asia, including the reality of caste oppression and anti-Muslim violence in India, the analogy between white nationalism and Hindu nationalism is certainly relevant. Both white nationalism and Hindu nationalism express pride in a mythic “Aryan” racial identity, claimed alternately by white Europeans and dominant-caste Hindus. Both ideologies share a virulent Islamophobia, and have a history of anti-Muslim hate speech and violence in the name of a “battle of civilizations” against Islam. 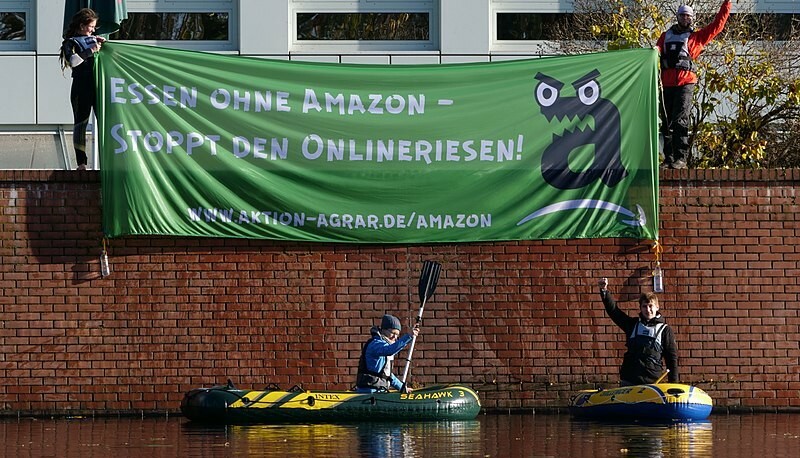 And both ideologies have gained prominence in the past few years under the watch of right-wing populist leaders Narendra Modi and Donald Trump. 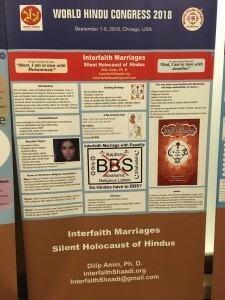 According to Raghuveer and Kathuria, these beliefs were visible at the World Hindu Congress itself, in materials depicting interfaith marriage as a “silent Holocaust of Hindus.” Considering the frequency of brutal violence against interfaith and intercaste couples in India, this messaging is anything but benign. In the Indian context, upper-caste Hindus vote disproportionately for the BJP. While the majority of Indian Americans lean Democrat, this doesn’t necessarily correspond with opposition to Hindu nationalism. A statement from the Alliance for Justice and Accountability points to these inequalities and calls on Indian Americans who benefit from caste privilege to take a stand against Hindu nationalism. 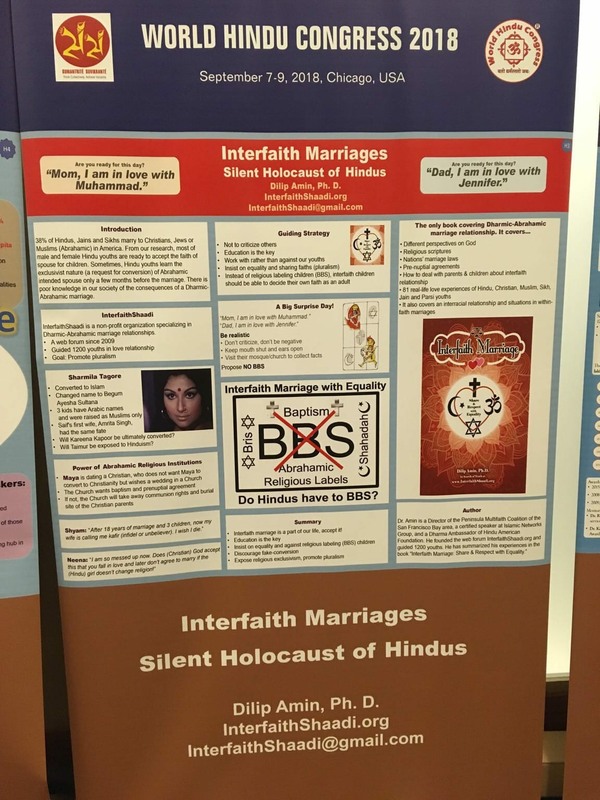 Protestors called on Indian-American politicians, many of whom are Democrats, to demonstrate their commitment to minority rights by rejecting Hindu nationalism. The Alliance for Justice and Accountability called for a boycott of the World Hindu Congress. Democratic State Senatorial candidate Ram Villivalam, Chicago City Alderman Ameya Pawar, California State Assemblyman Ash Kalra, North Carolina State Senator Jay Chaudhuri, and U.S. Representative Tulsi Gabbard eventually pulled out of their scheduled appearances. Illinois Congressman Raja Krishnamoorthi did speak at the Congress, for which he’s received criticism and continued demands from organizers to denounce the event and the violence against protestors. Finally, Chicago South Asians for Justice demanded that Chicago Alderman Ameya Pawar oppose Chicago’s proposed $95 million police and fire training center. Chicagoans have protested the center, arguing that money would be better spent on people-oriented programs. For Kathuria, protesting the police academy and protesting the World Hindu Congress are both part of a global struggle against state and state-sanctioned violence. That’s what came through most clearly in my conversation with the Chicago South Asians for Justice activists: while violent nationalisms may be global, so is resistance. “Standing against state violence means standing against it everywhere,” Kathuria said. Cover photo: Vice President of India M. Venkaiah Naidu addressing the World Hindu Congress on September 9th. Press Information Bureau of India, Wikimedia Commons.